Our Diamond Grid sticker design template makes it easy to print custom stickers that showcase your brand. This is an excellent sticker design template for any company that wants to lend a sense of opulence and luxury to its products and services. 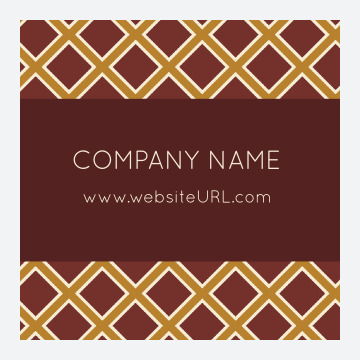 The design features your company name and website URL on a bold solid-colored banner, backed by a three-toned diamond grid pattern. Diamond Grid is available in three unique color combinations as well as three different shapes: square, rounded square, and circle. Use our free design tool to customize Diamond Grid today! Point-and-click your way to a custom sticker design with our free online design tool – design skills not required! Our intuitive interface makes it easy to choose your color scheme, edit text, and even upload your own photos so you can print personalized stickers that perfectly match your brand. If you want fast turnaround and reliability, look no further than PsPrint’s custom sticker printing service. We use only premium paper stocks and vivid soy inks to produce beautiful vinyl stickers, bumper stickers, sheet stickers, window clings, wine bottle labels and more. We’re so sure you’ll love your custom stickers, we guarantee it! Need an advanced custom sticker printing solution? PsPrint is here to bring your vision to life. From die-cut stickers in just about any shape imaginable to elegant foil stamps to even more exotic customizations, we’re here to make sure your stickers are as unique as your company. And don’t forget we offer a full suite of other print marketing tools as well, including postcards, business cards, banners, and more!